↑ "Emirates Airlines Flight Schedules". cleartrip.com. पहुँचतिथी 13 June 2017. ↑ "Emirates SkyCargo". The Emirates Group. पहुँचतिथी 26 August 2009. 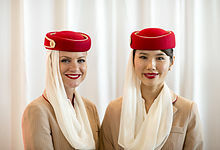 ↑ "Emirates Announces 2009 Expansion Plan" (Press release). Emirates (airline). 18 February 2009. पहुँचतिथी 3 August 2010. ↑ UAEinteract.com (31 दिसंबर 2008). "Emirates and Dnata now under ICD UAE". Uaeinteract.com. पहुँचतिथी 15 July 2009. ↑ "Emirates and Dnata now under ICD". Gulfnews. पहुँचतिथी 15 July 2009. ↑ "Dubai moves ownership of Emirates, Dnata to ICD – Transportation". ArabianBusiness.com. 31 दिसंबर 2008. पहुँचतिथी 15 July 2009. ↑ Reece, Damian (13 August 2000). "Emirates poised to join Star Alliance". London: Telegrapg.co.uk. प. 11. पहुँचतिथी 16 October 2010.